A very healthy cuisine prepared with fresh ingredients that brings a lot of flavors which a lot of people consider "confusing" and turns some people off, but when you follow the Thai thought process, they consider "heaven" to be "sweet / sour / salty and hot" which describes this food to a"T" and is terribly addicting.... really! 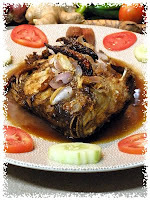 Thai Fried Whole Fish with Tamarind Sauce.- An amazing dish with the sweet tart taste of tamarind (a familiar and popular ingredient in Mexico too!).... that is served for celebrations or family gatherings but can be a great weekend dinner too! Over high heat, quick fry shallots in a dry wok or skillet until peels are burned, about 15-20 seconds. This will bring out the shallot's aroma. Remove charred peel and crush. Crush the garlic and set aside. Put a 1/2 cup of the oil in a saucepan over low heat. Add the garlic and keep stirring until it turns slightly yellow or about 1 minute. Transfer the garlic to a plate lined with paper towels. Add chiles to oil and deep fry over low heat for 30 seconds. Transfer to another plate lined with paper towels. Add the rest of the oil and heat over high heat. Carefully add the fish and let it cook about 5 minutes on each side. Using a fork probe the fish meat, if the fork sticks with the meat the fish is not yet cooked. After the fish is cooked, transfer to a plate lined with paper towels and set aside. Add the tamarind paste, palm sugar, fish sauce and water in a saucepan over medium heat for 5 minutes. Add the peppercorns and stir to mix well. Taste and adjust to balance the saltiness, sourness and sweetness. Turn off the heat. Set the fish on a serving plate and pour the sauce over the fish. Top with garlic, shallots and chiles. Serve hot with steamed jasmine rice. Thai Jasmine Rice.- Jasmine rice is a particularly fine, medium-grain type of rice. It is fragrant when cooked, hence the name. The polished white rice is prepared without salt to balance the Thai flavors. Please do not serve ordinary rice from the supermarket with Thai meals! Traditional Red Curry.- A wonderful dish that can be prepared in advance, save the curry in an air tight container for later use, and brought out when you need it as it can be used in many ways and always wonderful...... be patient and you will be rewarded with an exotic meal! In the mortar and pestle or electric blender, grind together the dried chiles and salt. Allow at least 10 minutes by hand, or a couple of minutes with a blender. It should be smooth with just a hint of chile pieces. Add the garlic cloves and pound until smooth. Cut off the very root end of the lemon grass. Remove outer leaves and discard. Cut the lemon grass crosswise into 1/8-inch pieces with a very sharp knife. Add to the ground chiles, along with the turmeric. Grind again until smooth. Your arm will tire, so take a break. Cook the pumpkin in boiling water to cover until al dente (still firm in the middle), about 4 minutes. Drain and set aside. Pour the coconut milk into a medium-sized pot. Add the curry paste to and stir to blend. Bring to a boil over medium-high heat. Add the pork. Boil 3 minutes until the pork is partially cooked. Add the squash. Bring to a boil again and cook until the squash is soft, about 4 minutes. Add fish sauce to taste. Garnish with cilantro leaves if desired. 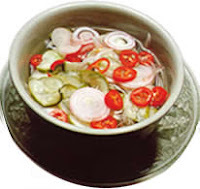 Thai Cucumber Salad.- Serve this cucumber relish alongside Satay or with any Thai meal that needs a cooling side-dish. Wash the cucumbers, cut into quarters lengthwise, then cut across into thin slices. Mix vinegar, sugar and salt together, simmer over medium heat until dissolved and the sauce slightly thickens. Remove from the heat and allow to cool. Just before serving, pour the cold sauce over the vegetables, and sprinkle with chopped coriander on top. 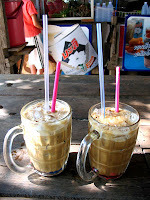 Thai Iced Coffee.- Thai iced coffee is very popular with Thais and foreigners alike and is known in Thai as Oliang. This s a blend of coffee and other ingredients, like 50% coffee, 25% corn, 20% soya bean, 5% sesame seed. Which is why it's quite unique in it's taste. Traditionally,oliang is brewed with a tung dtom kaffee, a metal ring with a handle to which a cloth bag is attached. It is sometimes referred to in English as a 'tea sock' (because this is what it really looks like, a sock hanging from a ring, lol) as it is also used for making Thai tea. To make coffee like this, put the oliang in the bag and pour boiling water through into a carafe. Let the bag steep for approximately 10 minutes until strong. Add sugar and stir to dissolve. Allow to cool. Pour into a glass with ice, and add the dairy product of your choice: half and half, condensed milk, evaporated milk or a mixture of these three. The proportions of coffee, water and sugar may vary according to taste. Try using 2/3 part oliang to 1 1/4 parts sugar to 6 parts water. Thais like their coffee incredibly sweet! 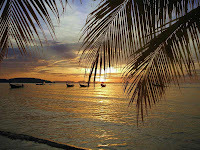 A lovely time enjoyed by all, relieving some of our favorite tastes!.... and although it might not be a Christmas-e style taste or food you would associate with any holidays we celebrate, the subtle or exotic tastes really add a lot to our celebratory mood.... Thai food is great anytime!!! !